Please be advised that the completion of sanitary bypass and pipe lining work along E. Medical Center Drive is scheduled from the evening of Thursday, March 15 through the end of Saturday, March 17. Beginning after 5:30 p.m. on Thursday, March 15, ramps are expected to be placed across drive lanes of the P2 and P3 parking structures, with entrances and exits remaining open to parkers. Parkers are encouraged to drive cautiously when ramps are in place. Three parking spaces will likely be closed on Level 1 of the P3 parking structure. 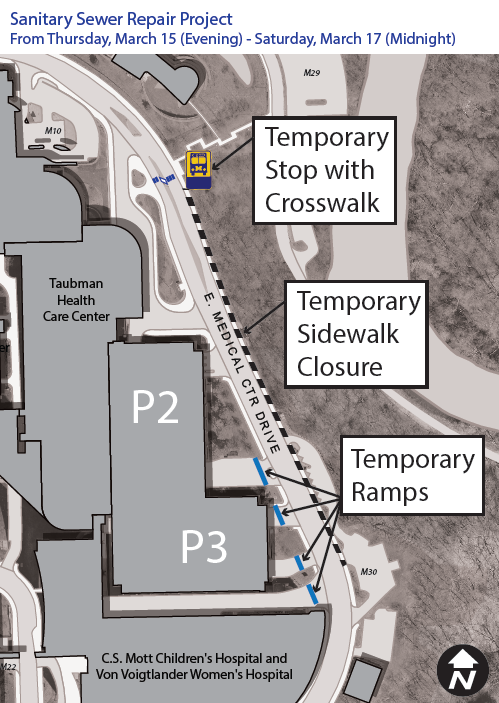 Beginning at 7 p.m. on Thursday, March 15, the bus stop along the east side of E. Medical Center Drive (across from Taubman) is scheduled to be temporarily shifted to the north. A temporary sidewalk closure along the east side of E. Medical Center Drive will also be put in place and pedestrians will be rerouted to nearby crosswalks. A harmless odor may be noticed during project work. Signage will be posted in advance alerting pedestrians and parkers of project work.